Biography: Born in Greece, Chirico studied at the Athens Polytechnic School, and painted landscapes until 1906, when he left Greece for Munich to enroll in the Royal Academy of Fine Arts. There, he was greatly influenced by the German philosophers. In 1909, he began a tour of Italy which eventually led to his depictions of "the melancholy of the afternoons of the fine autumn days in Italian towns." One such painting from this period was the The Enigma of a Autumn Afternoon (1910). After Italy, he lived in Paris, where he exhibited in the Salons d’Automne and the Salons des Independants. Picasso and Apollinaire were said to be the only ones to appreciate his work. In Ferrara, between the years of 1915 and 1918, he invented pittura metafisica (metaphysical painting) with Carlo Carra. He moved to Rome in 1918, where he became a founding member of the Valori Plastici group. He soon abandoned his surrealist style and turned towards classicism. 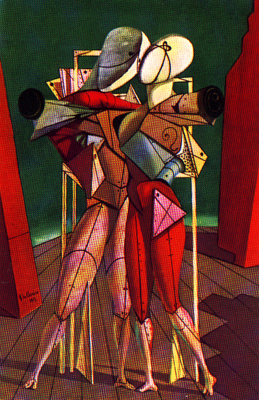 He imposed this new style on his designs for the ballet Bal (1929), written by Rieti for Diaghielv. Breton and his group accused Chirico of betraying his genius during this period. Chirico finally returned to Rome to embrace an academic lifestyle. To explain this period in his life, Chirico wrote an story entitled Une aventure de Monsieur Dudron (1939), which describes the life of a mad and solitary painter.